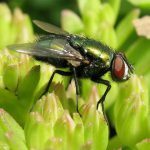 Bottle flies or Blow flies are known for their distinctive metallic green or blue color. They create a persistent buzzing sound and feed on decaying meat which makes them transmitters of diseases. These flies lay their eggs on dead carcasses or rotting flesh producing fly larvae or maggots until they hatch. Females can lay up to 180 eggs at a time. Typically bottle flies are found outdoors, but if you have a large number of bottle flies inside, an indoor breeding site may have been established. The presence of bottle fly larvae indoors may also be evidence of an infestation. An indoor infestation usually means there is evidence of decaying meat within the home. It could be as simple as a piece of meat stuck in the garbage disposal or a mouse in a trap that hasn’t been discarded. It could also mean a rodent or animal is decaying in a wall or attic area that isn’t accessible. If it is the latter try to identify the rotting carcass by smell and look for evidence of fly larvae to trace back to the breeding area.